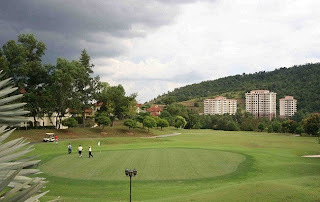 This 907sf property is located at Meru Valley Resort,Ipoh. Enjoy breathtaking views of green hills and crisp fresh air . Meru Valley Resort had recently clinched the CNBC award for Best Golf Course Development. This property has 2 rooms 2 baths, property comes with complimentary club facilities such as swimming pool, basketball court, gym, 2 tier driving range, jogging track, restaurant, cafe childrens play area and much more. Asking price RM193,000 .Please contact Gladwin at 012-5261000 for viewing. We'd done one of the condo's interior design/custom made furniture. The interior space and most important the great environment worth the asking price; under RM200K.